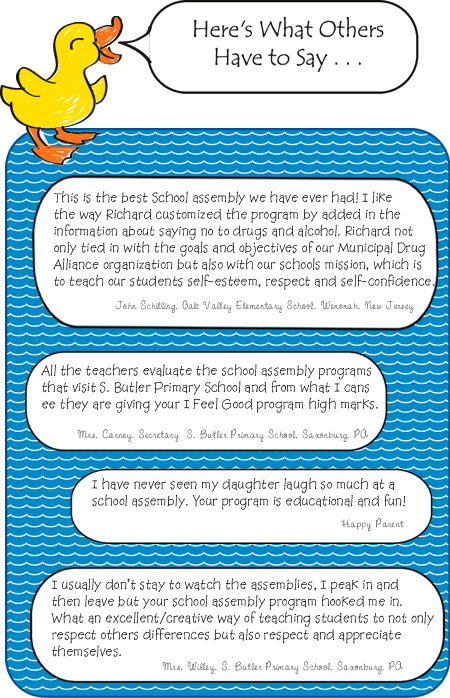 If you're looking for an elementary assembly program that explains self-esteem do's and don'ts, that promotes positive self-talk and what to do when you feel your self-esteem is starting to fall, then school assembly guy Richard Paul's I Feel Good is the right program for you and your students. Promotes determination, self-control, positive behavior, character skills, listening skills, self-discipline, helping others and clearly explains how we can become anything we want to be with the right attitude and keeping our bodies healthy (i.e. not taking drugs). Click HERE to download our self-esteem, character education handbook! Click HERE if you want to download a poster to advertise Richard's show! This 40-45 minute elementary school assembly program teaches the importance of self- esteem, self-respect and the meaning of feeling good. Gershen Kaufman, Phd, Lev Raphael, Ph. 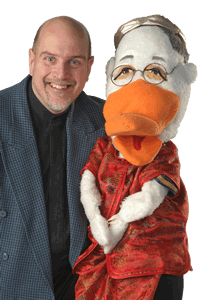 D and Pamela Espeland in their outstanding book "STICK UP FOR YOURSELF", explains that "positive self-esteem is the single most important psychological skill we can develop in order to thrive in society." As a bully prevention specialist Richard Paul has studied why self-esteem is so important. He has discovered that students who keep their head up high, walk up straight and give eye contact are not only less likely to be bullied they are more likely to express positive behavior and academic success. I Feel Good is an elementary motivational school assembly program that gives the students the tools they need to help build their positive self-esteem. 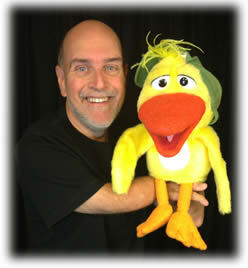 Richard along with his puppet friends and fun audience participation reminds the students to believe in themselves and their unique abilities. They will quickly discover how to list out three things that they are proud of and why it is important to monitor what they say to themselves and to others. They quickly come to understand that self-esteem isn't bragging or believing you are better than someone else, positive self-esteem is being proud of your abilities, your talents and your willingness to be respectful and loving to others. "I just wanted to personally thank you for the wonderful program you did today for the students of St. Stephen's. 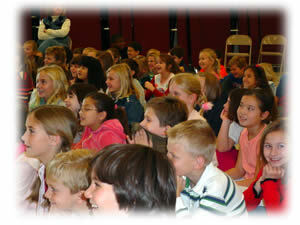 The children loved the program and they received an excellent message. Bravo! We will definitely see you next year." Richard shares that self-esteem does not come from the way we look or how we dress or material things. Self-esteem doesn't come from people who praise you or complement you. Self-esteem comes from inside. It is an inner knowing and respect for the person you are. Self-esteem is learned and earned, it is a result of persons pride and that pride comes from their positive behavior and actions. The I Feel Good assembly program is not only fun and interactive it is an elementary school assembly program that inspires student to take positive risks, resist negative peer pressure, cope with changes and challenges of life, work through disappointments and so called failures, set goals and strive to obtain them, make the most of their creativity and why it is so important to have a positive attitude. equally impressed. I am so happy that you were able to fit our school into your busy east coast schedule." Many schools have Positive Behavior Support Systems in place and the I Feel Good program can be customized to fit within your school's behavior mission and policy.